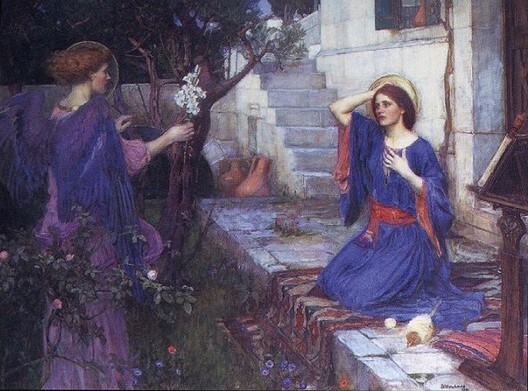 Annunciation, 1914, John William Waterhouse. Blue of the sky, blue of the sea. The Virgin Mary is usually dressed in blue, to show there was something of heaven in her. She is not entirely of this earth. Not divine of course, but something more than we are. Angels are usually shown in white or gold, but Waterhouse went out on a limb to clothe his angel in sumptuous purple – the royal color. 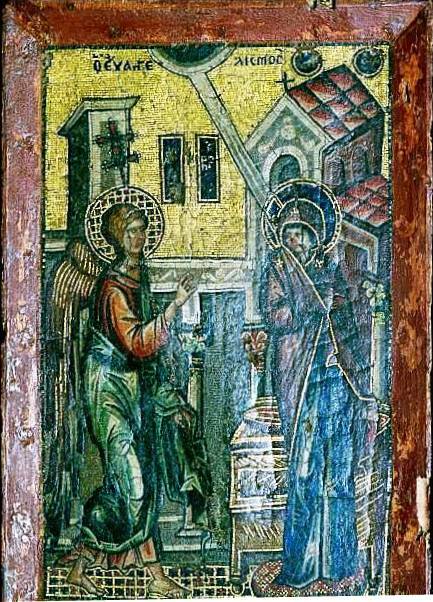 And now for something completely different: a Byzantine mosaic of the Annunciation, of gold, silver and lapis lazuli. It was made in about 1320 and the years have taken their toll, but it is still beautiful. Notice the buildings behind the two figures: this creates a sort of stage on which they act out their drama. This could be any beautiful woman walking in a garden, were it not for the halo that circles her head. 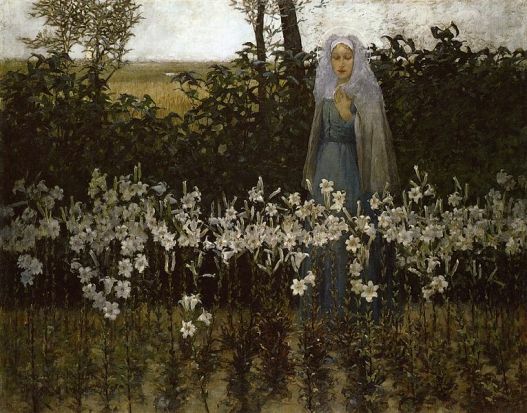 Mary is transfixed by the lilies, symbols of her virginity, and ponders what that will mean in the future that stretches ahead. 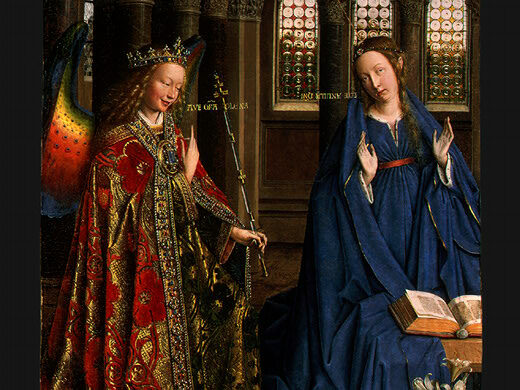 Annunciation, 1434, Jan Van Eyck. Van Eyck’s original painting is much larger than this, and packs in multiple symbolic meanings. It’s a pity if this distracts you away from those two faces, especially the angel’s. That gorgeous creature is practically laughing with happiness as Mary’s hands show her complete acceptance of God’s plan for a human-born Messiah. 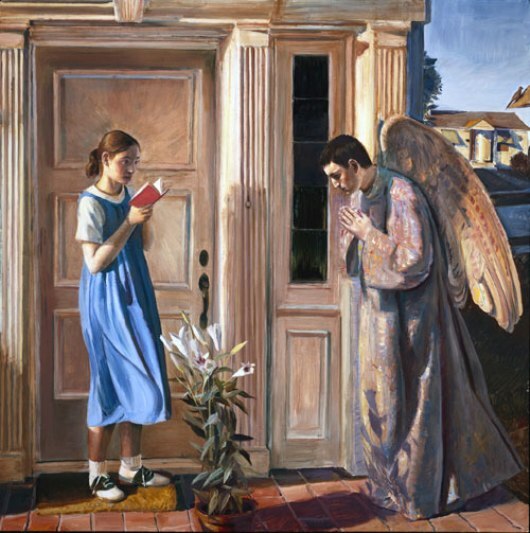 Could anything be more different than this modern painting of the Annunciation? Mary as a sneaker-wearing adolescent outside her own front door… What next!! But the innocence of a young girl is in that face, and the angel’s reverence speaks volumes. Both of them know this is an earth-changing moment. Notice that Collier makes a reference to medieval paintings by inserting a book and the lilies – see Van Eyck’s paintings above – he does the same. What an angel! So complex, with a face full of tenderness and pity. 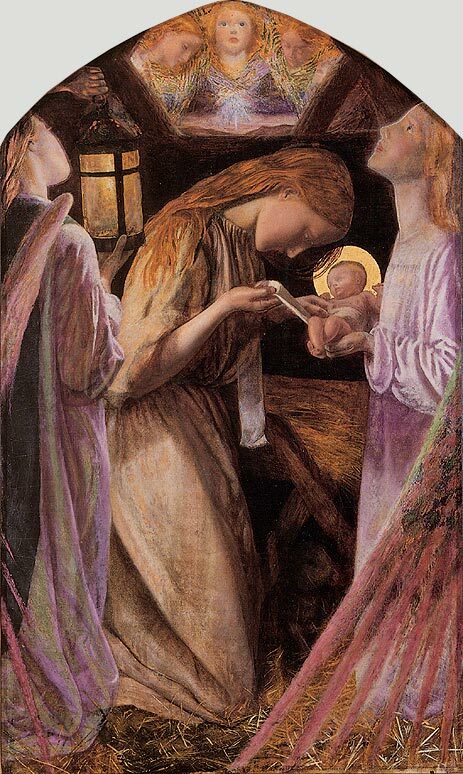 As if the Angel already knows all that the future holds for Mary. 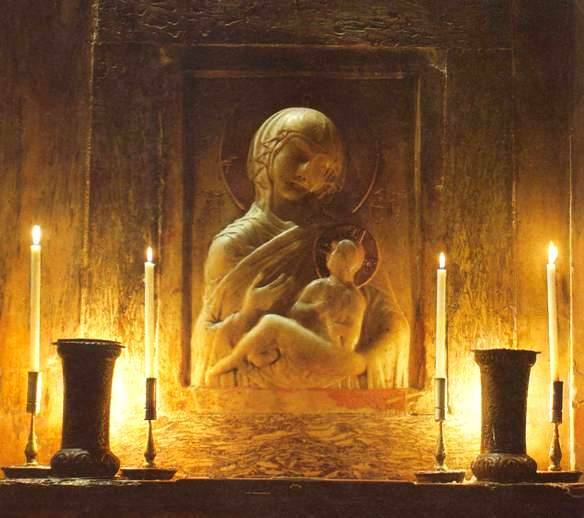 And Mary, so simple, so untouched as yet by tragedy. Petrus Christus (what a name!) 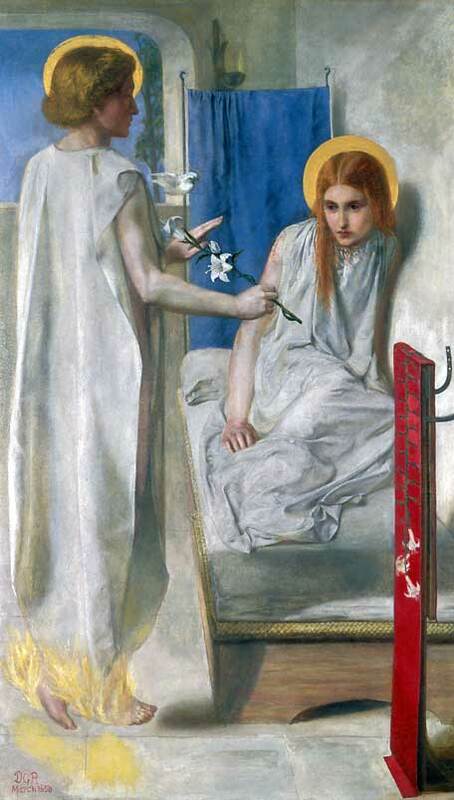 was well known for his paintings of angels, and in particular the wings of these angels. Sumptuous colors, intricate patterns. 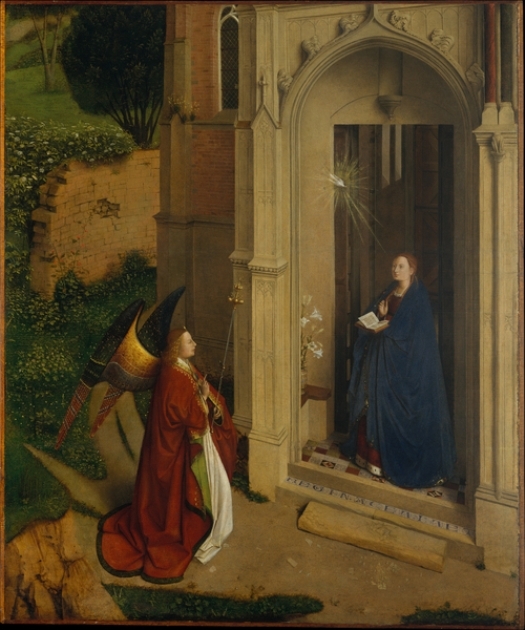 In fact, his angels usually dominate the paintings even when, as in this painting of the Annunciation, the focus is supposed to be on the Virgin Mary. Notice the ruined building in the left background: the old order is being replaced by the new, as Mary crucially agrees to be the Mother of God. 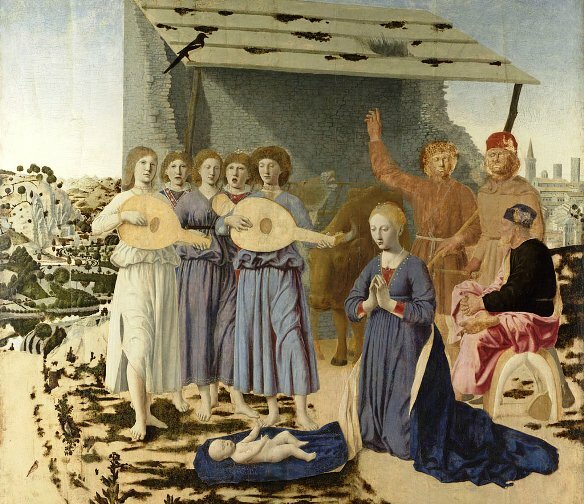 Hughes’ painting is beautiful, truly lovely, but it lacks the vigour and theological confidence of earlier paintings of the Nativity. Mary is a sweet-faced, submissive innocent – the ideal of Victorian womanhood; the angels do not demand our attention as, for example, the angels of Petrus Christus do. 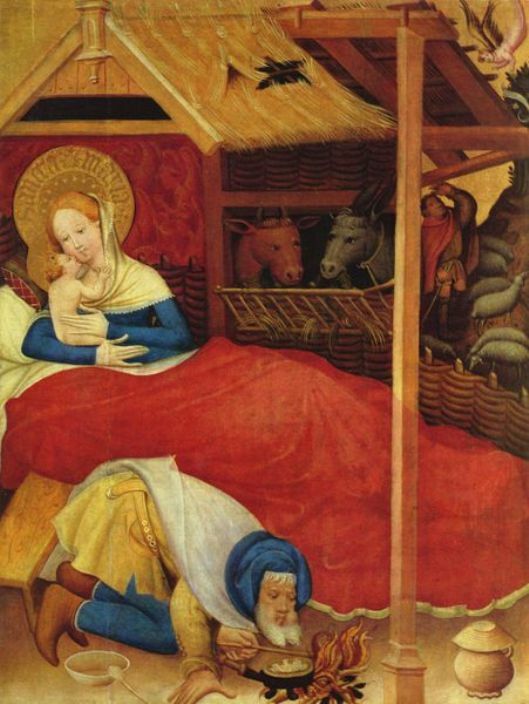 The trampled straw on the stable floor hints at the real world into which this innocent babe has been born. This is not Mary Queen of Heaven with the Infant Saviour, but a happy woman savouring the sight and smell of her new baby as it snuggles up to her. It is the prototype of a happy family: a contented baby, a smiling well-cared for mother, and a father rising to the occasion by sensibly heating up some food for everyone. The colors used by von Soest emphasise their simplicity and confidence. 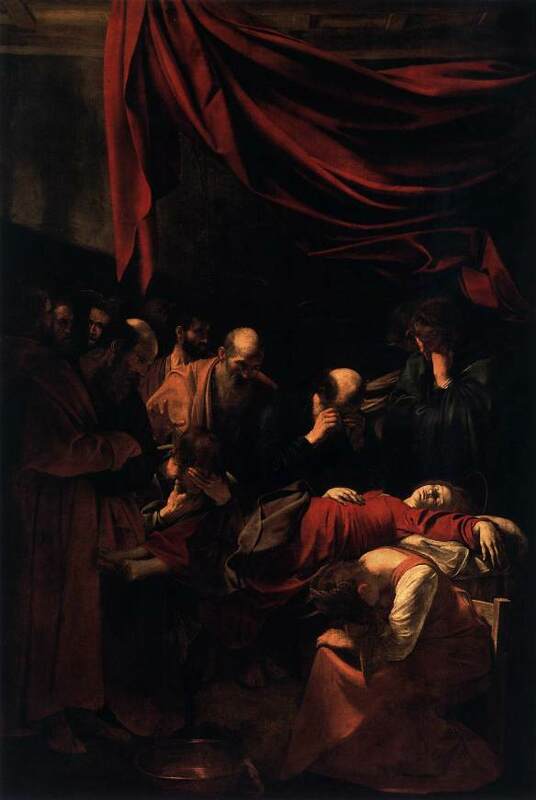 This painting by Caravaggio caused a scandal when it was first seen, because Caravaggio showed a very human woman slumped on the floor, exhausted after giving birth. To viewers in the early 1600’s, this was confronting, even blasphemous. They believed the birth process had been both painless and miraculous for Mary, in that Jesus was born without breaking her hymen: she remained a virgo intacta. No wonder it was controversial. 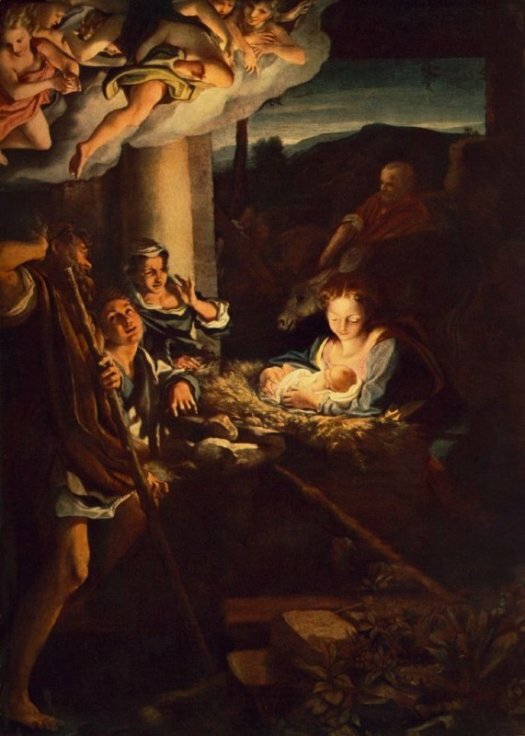 At the center of the painting is the Infant Jesus, enclosed in his mother’s arms; she in turn is enclosed by the maidservants and the shepherd. 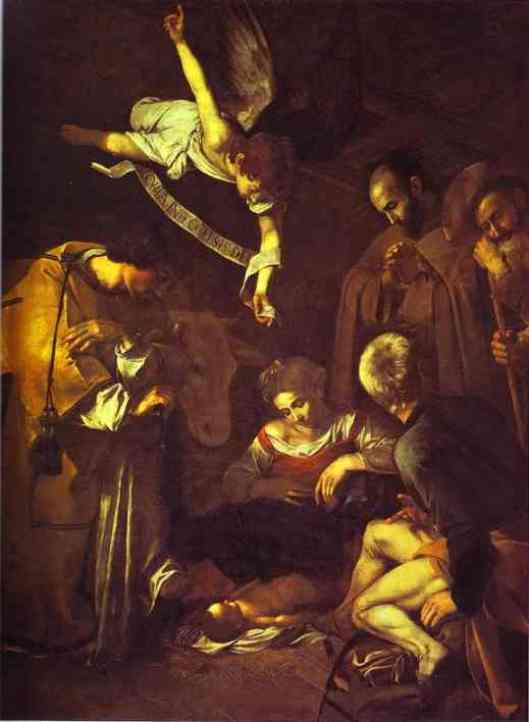 Every figure in the painting has been effected by the light coming from the new-born Christ – even the animals. Mary, the new mother, is completely engrossed in her tiny son, and seems not to be aware of anything else. A question: why is the shepherdess with upraised arm grimacing against the light coming from Jesus? What was Correggio’s message in showing her thus? 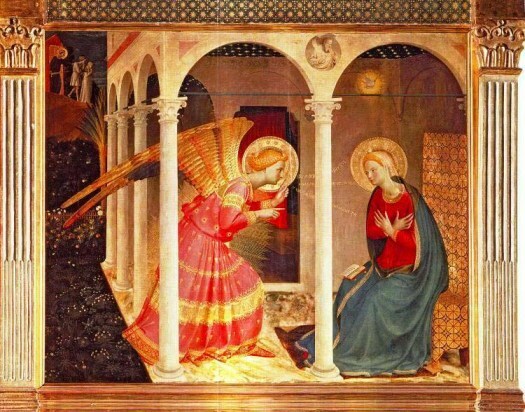 Mary kneels in ethereal simplicity before her newborn baby, while a chorus of angels sing enthusiastically. Joseph is at the right, with two rather uncouth-looking shepherds – a nice touch of realism. 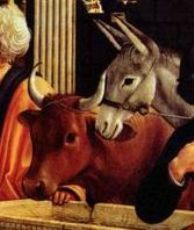 The ox to Mary’s right leans forward to smell and see the newborn baby – just as real animals do. The landscape in the background shows the foothills of the Apennines, and the town on the right is Borgo San Sepolcro, where the painter was born in 1416. 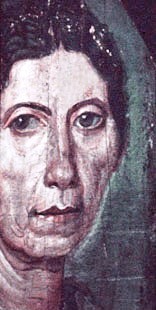 Strange to think that this painting was done a full thirty years before Columbus sailed on his epic voyage to America. 18 Now the birth of Jesus Christ took place in this way. 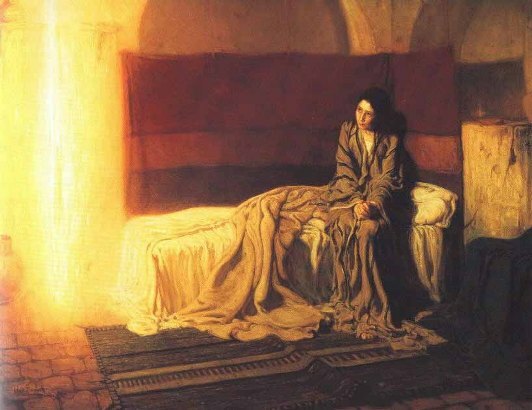 When his mother Mary had been betrothed to Joseph, before they came together she was found to be with child of the Holy Spirit; 19 and her husband Joseph, being a just man and unwilling to put her to shame, resolved to divorce her quietly. 20 But as he considered this, behold, an angel of the Lord appeared to him in a dream, saying, “Joseph, son of David, do not fear to take Mary your wife, for that which is conceived in her is of the Holy Spirit; 21 she will bear a son, and you shall call his name Jesus, for he will save his people from their sins.” 22 All this took place to fulfil what the Lord had spoken by the prophet: 23 “Behold, a virgin shall conceive and bear a son, and his name shall be called Emmanuel” (which means, God with us). 24 When Joseph woke from sleep, he did as the angel of the Lord commanded him; he took his wife, 25 but knew her not until she had borne a son; and he called his name Jesus. This ancient statue of Mary, now in St Mark’s, Venice, is called the Hodegetria, meaning ‘she who shows the way’ . Mary, Jesus’ first teacher, seems to point the way to the Infant Jesus. You will see this same pose in many icons from the Eastern Christian Churches.